There is an assembler for each of the MIPS, SPARC, Intel 386, AMD64, Power PC, and ARM. The 68020 assembler, 2a, (no longer distributed) is the oldest and in many ways the prototype. The assemblers are really just variations of a single program: they share many properties such as left-to-right assignment order for instruction operands and the synthesis of macro instructions such as MOVE to hide the peculiarities of the load and store structure of the machines. To keep things concrete, the first part of this manual is specifically about the 68020. At the end is a description of the differences among the other assemblers. The document, ‘‘How to Use the Plan 9 C Compiler’’, by Rob Pike, is a prerequisite for this manual. All pre-defined symbols in the assembler are upper-case. Data registers are R0 through R7; address registers are A0 through A7; floating-point registers are F0 through F7. A pointer in A6 is used by the C compiler to point to data, enabling short addresses to be used more often. The value of A6 is constant and must be set during C program initialization to the address of the externally-defined symbol a6base. The following hardware registers are defined in the assembler; their meaning should be obvious given a 68020 manual: CAAR, CACR, CCR, DFC, ISP, MSP, SFC, SR, USP, and VBR. The assembler also defines several pseudo-registers that manipulate the stack: FP, SP, and TOS. FP is the frame pointer, so 0(FP) is the first argument, 4(FP) is the second, and so on. SP is the local stack pointer, where automatic variables are held (SP is a pseudo-register only on the 68020); 0(SP) is the first automatic, and so on as with FP. Finally, TOS is the top-of-stack register, used for pushing parameters to procedures, saving temporary values, and so on. The assembler and loader track these pseudo-registers so the above statements are true regardless of what has been pushed on the hardware stack, pointed to by A7. The name A7 refers to the hardware stack pointer, but beware of mixed use of A7 and the above stack-related pseudo-registers, which will cause trouble. Note, too, that the PEA instruction is observed by the loader to alter SP and thus will insert a corresponding pop before all returns. The assembler accepts a label-like name to be attached to FP and SP uses, such as p+0(FP), to help document that p is the first argument to a routine. The name goes in the symbol table but has no significance to the result of the program. When using labels, there is no (PC) annotation. The <> will be filled in at load time by a unique integer. Expressions are mostly what one might expect. Where an offset or a constant is expected, a primary expression with unary operators is allowed. A general C constant expression is allowed in parentheses. Source files are preprocessed exactly as in the C compiler, so #define and #include work. The simple addressing modes are shared by all the assemblers. Here, for completeness, follows a table of all the 68020 addressing modes, since that machine has the richest set. In the table, o is an offset, which if zero may be elided, and d is a displacement, which is a constant between -128 and 127 inclusive. Many of the modes listed have the same name; scrutiny of the format will show what default is being applied. For instance, indexed mode with no address register supplied operates as though a zero-valued register were used. For "offset" read "displacement." For ".s" read one of .L, or .W followed by *1, *2, *4, or *8 to indicate the size and scaling of the data. In the first form, DYNT defines the symbol to be a small unique integer constant, chosen by the loader, which is some multiple of the word size. In the second form, DYNT defines the second symbol in the same way, places the address of the most recently defined text symbol in the array specified by the first symbol at the index defined by the value of the second symbol, and then adjusts the size of the array accordingly. The INIT pseudo-instruction takes the same parameters as a DATA statement. Its symbol is used as the base of an array and the data item is installed in the array at the offset specified by the most recent DYNT pseudo-instruction. The size of the array is adjusted accordingly. The DYNT and INIT pseudo-instructions are not implemented on the 68020.
will not be profiled; the first version above would be. Subroutines with peculiar state, such as system call routines, should not be profiled. Setting the 2 bit allows multiple definitions of the same TEXT symbol in a program; the loader will place only one such function in the image. It was emitted only by the Alef compilers. Subroutines to be called from C should place their result in R0, even if it is an address. Floating point values are returned in F0. Functions that return a structure to a C program receive as their first argument the address of the location to store the result; R0 is unused in the calling protocol for such procedures. A subroutine is responsible for saving its own registers, and therefore is free to use any registers without saving them (‘‘caller saves’’). A6 and A7 are the exceptions as described above. If you get confused, try using the -S option to 2c and compiling a sample program. The standard output is valid input to the assembler. generates official MOVEQ, MOVEA, and MOVESR instructions. A number of instructions do not have the syntax necessary to specify their entire capabilities. Notable examples are the bitfield instructions, the multiply and divide instructions, etc. For a complete set of generated instruction names (in 2a notation, not Motorola’s) see the file /sys/src/cmd/2c/2.out.h. Despite its name, this file contains an enumeration of the instructions that appear in the intermediate files generated by the compiler, which correspond exactly to lines of assembly language. The loader modifies the code produced by the assembler and compiler. It folds branches, copies short sequences of code to eliminate branches, and discards unreachable code. The first instruction of every function is assumed to be reachable. The pseudo-instruction NOP, which you may see in compiler output, means no instruction at all, rather than an instruction that does nothing. The loader discards all NOP’s. To generate a true NOP instruction, or any other instruction not known to the assembler, use a WORD pseudo-instruction. Such instructions on RISCs are not scheduled by the loader and must have their delay slots filled manually. The registers are only addressed by number: R0 through R31. R29 is the stack pointer; R30 is used as the static base pointer, the analogue of A6 on the 68020. Its value is the address of the global symbol setR30(SB). The register holding returned values from subroutines is R1. When a function is called, space for the first argument is reserved at 0(FP) but in C (not Alef) the value is passed in R1 instead. The loader uses R28 as a temporary. The system uses R26 and R27 as interrupt-time temporaries. Therefore none of these registers should be used in user code. Floating point registers are called F0 through F31. By convention, F24 must be initialized to the value 0.0, F26 to 0.5, F28 to 1.0, and F30 to 2.0; this is done by the operating system. The instructions and their syntax are different from those of the manufacturer’s manual. There are no lui and kin; instead there are MOVW (move word), MOVH (move halfword), and MOVB (move byte) pseudo-instructions. If the operand is unsigned, the instructions are MOVHU and MOVBU. The order of operands is from left to right in dataflow order, just as on the 68020 but not as in MIPS documentation. This means that the Bcond instructions are reversed with respect to the book; for example, a va BGTZ generates a MIPS bltz instruction. The assembler is for the R2000, R3000, and most of the R4000 and R6000 architectures. It understands the 64-bit instructions MOVV, MOVVL, ADDV, ADDVU, SUBV, SUBVU, MULV, MULVU, DIVV, DIVVU, SLLV, SRLV, and SRAV. The assembler does not have any cache, load-linked, or store-conditional instructions. Some assembler instructions are expanded into multiple instructions by the loader. For example the loader may convert the load of a 32 bit constant into an lui followed by an ori. when it needs a true no-op instruction. Use exactly this instruction when scheduling code manually; the loader recognizes it and schedules the code before it and after it independently. Also, WORD pseudo-ops are scheduled like no-ops. The NOSCHED pseudo-op disables instruction scheduling (scheduling is enabled by default); SCHED re-enables it. Branch folding, code copying, and dead code elimination are disabled for instructions that are not scheduled. Once you understand the Plan 9 model for the MIPS, the SPARC is familiar. Registers have numerical names only: R0 through R31. Forget about register windows: Plan 9 doesn’t use them at all. The machine has 32 global registers, period. R1 [sic] is the stack pointer. R2 is the static base register, with value the address of setSB(SB). R7 is the return register and also the register holding the first argument to a C (not Alef) function, again with space reserved at 0(FP). R14 is the loader temporary. Floating-point registers are exactly as on the MIPS. Move instructions are similar to those on the MIPS: pseudo-operations that turn into appropriate sequences of sethi instructions, adds, etc. Instructions read from left to right. Because the arguments are flipped to SUBCC, the condition codes are not inverted as on the MIPS. R27 is the loader temporary. There is no support for floating point. The Intel calling convention is not supported and cannot be used; use BAL instead. Instructions are mostly as in the book. The major change is that LOAD and STORE are both called MOV. The extension character for MOV is as in the manual: O for ordinal, W for signed, etc. The assembler assumes 32-bit protected mode. The register names are SP, AX, BX, CX, DX, BP, DI, and SI. The stack pointer (not a pseudo-register) is SP and the return register is AX. There is no physical frame pointer but, as for the MIPS, FP is a pseudo-register that acts as a frame pointer. that the loader actually implements as pseudo-operations. 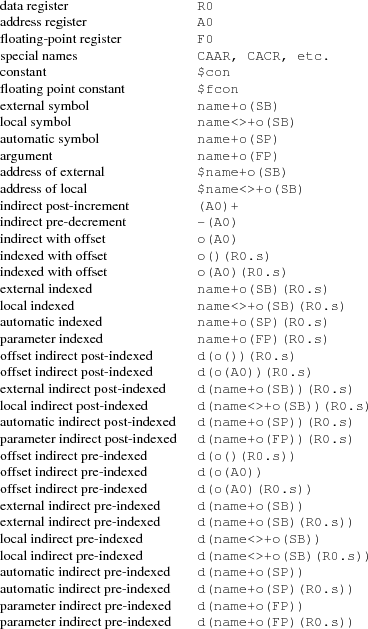 The names of conditions in all conditional instructions (J, SET) follow the conventions of the 68020 instead of those of the Intel assembler: JOS, JOC, JCS, JCC, JEQ, JNE, JLS, JHI, JMI, JPL, JPS, JPC, JLT, JGE, JLE, and JGT instead of JO, JNO, JB, JNB, JZ, JNZ, JBE, JNBE, JS, JNS, JP, JNP, JL, JNL, JLE, and JNLE. The addressing modes have syntax like AX, (AX), (AX)(BX*4), 10(AX), and 10(AX)(BX*4). The offsets from AX can be replaced by offsets from FP or SB to access names, for example extern+5(SB)(AX*2). Segment override prefixes in MOD/RM fields are not supported. to change to 32-bit mode. The effect is mainly to diagnose instructions that are illegal in the given mode, but the loader will also assume 32-bit operands and addresses, and 32-bit PC values for call and return. The assembler’s conventions are similar to those for the 386, above. The architecture provides extra fixed-point registers R8 to R15. All registers are 64 bit, but instructions access low-order 8, 16 and 32 bits as described in the processor handbook. For example, MOVL to AX puts a value in the low-order 32 bits and clears the top 32 bits to zero. Literal operands are limited to signed 32 bit values, which are sign-extended to 64 bits in 64 bit operations; the exception is MOVQ, which allows 64-bit literals. The external registers in Plan 9’s C are allocated from R15 down. There are many new instructions, including the MMX and XMM media instructions, and conditional move instructions. MMX registers are M0 to M7, and XMM registers are X0 to X15. As with the 386 instruction names, all new 64-bit integer instructions, and the MMX and XMM instructions uniformly use L for ‘long word’ (32 bits) and Q for ‘quad word’ (64 bits). Some instructions use O (‘octword’) for 128-bit values, where the processor handbook variously uses O or DQ. The assembler also consistently uses PL for ‘packed long’ in XMM instructions, instead of Q, DQ or PI. Either MOVL or MOVQ can be used to move values to and from control registers, even when the registers might be 64 bits. The assembler often accepts the handbook’s name to ease conversion of existing code (but remember that the operand order is uniformly source then destination). C’s long long type is 64 bits, but passed and returned by value, not by reference. More notably, C pointer values are 64 bits, and thus long long and unsigned long long are the only integer types wide enough to hold a pointer value. The C compiler and library use the XMM floating-point instructions, not the old 387 ones, although the latter are implemented by assembler and loader. Unlike the 386, the first integer or pointer argument is passed in a register, which is BP for an integer or pointer (it can be referred to in assembly code by the pseudonym RARG). AX holds the return value from subroutines as before. Floating-point results are returned in X0, although currently the first floating-point parameter is not passed in a register. All parameters less than 8 bytes in length have 8 byte slots reserved on the stack to preserve alignment and simplify variable-length argument list access, including the first parameter when passed in a register, even though bytes 4 to 7 are not initialized. The Power PC follows the Plan 9 model set by the MIPS and SPARC, not the elaborate ABIs. The 32-bit instructions of the 60x and 8xx PowerPC architectures are supported; there is no support for the older POWER instructions. Registers are R0 through R31. R0 is initialized to zero; this is done by C start up code and assumed by the compiler and loader. R1 is the stack pointer. R2 is the static base register, with value the address of setSB(SB). R3 is the return register and also the register holding the first argument to a C function, with space reserved at 0(FP) as on the MIPS. R31 is the loader temporary. The external registers in Plan 9’s C are allocated from R30 down. Floating point registers are called F0 through F31. By convention, several registers are initialized to specific values; this is done by the operating system. F27 must be initialized to the value 0x4330000080000000 (used by float-to-int conversion), F28 to the value 0.0, F29 to 0.5, F30 to 1.0, and F31 to 2.0. As on the MIPS and SPARC, the assembler accepts arbitrary literals as operands to MOVW, and also to ADD and others where ‘immediate’ variants exist, and the loader generates sequences of addi, addis, oris, etc. as required. The register indirect addressing modes use the same syntax as the SPARC, including double indexing when allowed. The instruction names are generally derived from the Motorola ones, subject to slight transformation: the ‘.’ marking the setting of condition codes is replaced by CC, and when the letter ‘o’ represents ‘OE=1’ it is replaced by V. Thus add, addo. and subfzeo. become ADD, ADDVCC and SUBFZEVCC. As well as the three-operand conditional branch instruction BC, the assembler provides pseudo-instructions for the common cases: BEQ, BNE, BGT, BGE, BLT, BLE, BVC, and BVS. The unconditional branch instruction is BR. Indirect branches use (CTR) or (LR) as target. Load or store operations are replaced by MOV variants in the usual way: MOVW (move word), MOVH (move halfword with sign extension), and MOVB (move byte with sign extension, a pseudo-instruction), with unsigned variants MOVHZ and MOVBZ, and byte-reversing MOVWBR and MOVHBR. ‘Load or store with update’ versions are MOVWU, MOVHU, and MOVBZU. Load or store multiple is MOVMW. The exceptions are the string instructions, which are LSW and STSW, and the reservation instructions lwarx and stwcx., which are LWAR and STWCCC, all with operands in the usual data-flow order. Floating-point load or store instructions are FMOVD, FMOVDU, FMOVS, and FMOVSU. The register to register move instructions fmr and fmr. are written FMOVD and FMOVDCC. The assembler knows the commonly used special purpose registers: CR, CTR, DEC, LR, MSR, and XER. The rest, which are often architecture-dependent, are referenced as SPR(n). The segment registers of the 60x series are similarly SEG(n), but n can also be a register name, as in SEG(R3). Moves between special purpose registers and general purpose ones, when allowed by the architecture, are written as MOVW, replacing mfcr, mtcr, mfmsr, mtmsr, mtspr, mfspr, mftb, and many others. producing mffs, mtfsf or mtfsfi, as appropriate. The assembler provides access to R0 through R14 and the PC. The stack pointer is R13, the link register is R14, and the static base register is R12. R0 is the return register and also the register holding the first argument to a subroutine. The external registers in Plan 9’s C are allocated from R10 down. R11 is used by the loader as a temporary register. The assembler supports the CPSR and SPSR registers. It also knows about coprocessor registers C0 through C15. Floating registers are F0 through F7, FPSR and FPCR. As with the other architectures, loads and stores are called MOV, e.g. MOVW for load word or store word, and MOVM for load or store multiple, depending on the operands. Addressing modes are supported by suffixes to the instructions: .IA (increment after), .IB (increment before), .DA (decrement after), and .DB (decrement before). These can only be used with the MOV instructions. The move multiple instruction, MOVM, defines a range of registers using brackets, e.g. [R0-R12]. The special MOVM addressing mode bits W, U, and P are written in the same manner, for example, MOVM.DB.W. A .S suffix allows a MOVM instruction to access user R13 and R14 when in another processor mode. Shifts and rotates in addressing modes are supported by binary operators << (logical left shift), >> (logical right shift), -> (arithmetic right shift), and @> (rotate right); for example R7>>R2or [email protected]>2. The assembler does not support indexing by a shifted expression; only names can be doubly indexed. Any instruction can be followed by a suffix that makes the instruction conditional: .EQ, .NE, and so on, as in the ARM manual, with synonyms .HS (for .CS) and .LO (for .CC), for example ADD.NE. Arithmetic and logical instructions can have a .S suffix, as ARM allows, to set condition codes. The syntax of the MCR and MRC coprocessor instructions is largely as in the manual, with the usual adjustments. The assembler directly supports only the ARM floating-point coprocessor operations used by the compiler: CMP, ADD, SUB, MUL, and DIV, all with F or D suffix selecting single or double precision. Floating-point load or store become MOVF and MOVD. Conversion instructions are also specified by moves: MOVWD, MOVWF, MOVDW, MOVWD, MOVFD, and MOVDF.